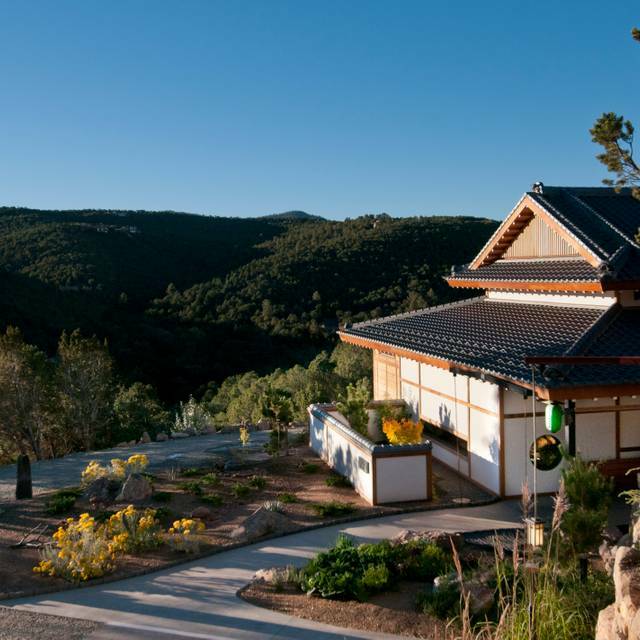 izanami is on the Ten Thousand Waves Spa & Resort property in Santa Fe NM. 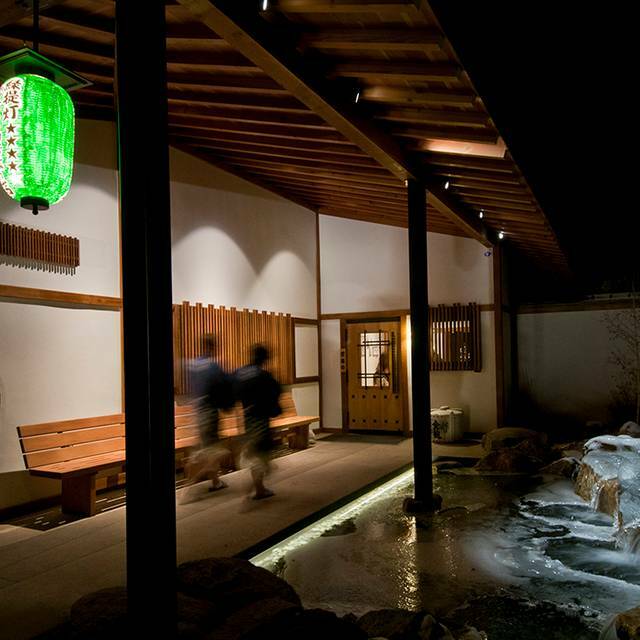 Park in the lower lot and walk up the footpath to the spa and Izanami. There’s a call button at the bottom of the path if you want a ride. Follow the handicapped signs to drive to the upper lot, closer to the restaurant. Izanami serves Japanese Izakaya fare: seasonally inspired small-plates meant for sharing, accompanied by the best sake list in the west. Booths are always at a premium and generally reserved for parties of 4 or more. A credit card is required for parties of 6 or more. Groups of six or more will be charged $25 for lunch and $50 for dinner per person for cancellations made inside of 24 hours. Izanami is a fragrance free environment. I've been to Izanami a few times and like the food and atmosphere. We only go there for special occasions because it's pricey. We decided to go there to celebrate our 34th wedding anniversary after a soak at the Waves. I made the reservation three weeks in advance for five pm and asked for a special table. Although I am aware that getting a choice table is never a sure thing I was hopeful since I'd booked early and 5 pm was not a rush hour. We arrived on time and were asked to wait and eventually were seated in a small booth in a room that only had one other occupied table. Our table was just next to a corridor that led to two other dining areas and the computer station for waiters so there were people and staff walking behind us constantly and it was rather noisy. We were given the worst table in the room. I decided to ask for a different table and the hostess eventually agreed but I felt hassled like she wanted to argue instead of accommodating us saying they had other guests coming etc. It felt bad. I am a long time Santa Fean and love the Waves but will not be going back to Izanami given it's not the first time I have felt snobby vibes there. Our interaction and experience didn't ruin our evening but def put a damper on our experience. Excellent food. An extensive saki selection. We had a table overlooking the mountains and it was lovely. Would definitely recommend. The food was delicious, and better still, served beautifully. Our server carefully explained the menu items we did not know. The room was quiet, even though there were others dining there. The car service from the parking lot is vital since there is little room near the restaurant. All in all, the afternoon was a pleasure! Perhaps we are spoiled living in southern California, but I was disappointed in what we had hoped would be the nicest meal during our vacation in Santa Fe. As an example of lost potential, although our waiter was excellent, learned, and enthusiastic he didn't listen to our request to avoid clams, mussels, and other shellfish due to my wife's dyspeptic (often eruptive) reactions to them. We ordered the omakase (chef's special) and yes, you guessed it, the fish portion came with mussels. We were personally disappointed in the uber-casual dress code chosen by some of the guests. While we dressed up for this special restaurant, a number of locals came in jeans, t-shirts, and (men) who left their baseball hats on. The restaurant should simply state "no jeans" and "collared shirt required. Start with the wait staff. On the plus side, the sake collection was great, as was the first course: sashimi with seaweed and cucumber. Fantastic sauce! ATB, Thank you for your review. We are glad you enjoyed the sake and sashimi and do apologize if you were served something after telling the server about your wifes allergy. As with most dining in Santa Fe, we don't have a dress code and often have people come from the spa in their kimonos which we both allow and encourage. We do hope you will visit again your next time in Santa Fe. We had such a good time. Food was beyond amazing and the waiter was extremely knowledgeable about Saki, and all the food. Izanami is one of my favorites in Santa fe. I took a friend for a special lunch who was visiting from the east coast and she fell in love with the shabu shabu and the refreshing yuzu sake. Our server and sake sommelier Mateo was lovely and very knowledgable about izakaya food, and of course, the sake! Thank you! Elyse, Thank you for the great reveiw and bringing your friends! We're glad you were able to enjoy the Shabu Shabu and we will pass on your comments to Mateo - they are appreciated! Terrible experience parking. I had a private tub suite reservation after dinner and spent a lot of money between dinner and spa. Shuttle driver had me park across the main road and FORGOT to pick me up. He was also sitting in a corner of the parking lot after 9 pm not making trips. I had to walk across the road and up the hill in the mud to dinner and back down and across in the dark. Because the driver was forgetful and lazy. Someone spending over $500 a night shouldn’t have to park across the road when others are just stopping at your bar. This isn’t our first time at Ten Thousand waves and I was very disappointed in this experience yesterday. We deeply regret that the security person directed you across the street and failed to follow up. We will speak with the person working this night. We are working to address our parking issue and increase and hope you will try us again. Unfortunately the restaurant on the premises of Ten Thousand Waves Spa does not measure up to the wonderful experience that we enjoyed at the Spa. The calamari was tough and chewy - basically inedible. The other food items that we ordered were average but not worth the money nor the hype of the restaurant. This was my third visit and as usual the food was excellent and the service was superb. Kudos to Stephanie for her attentiveness. I'll be back! Elaine, Thank you for the great review and acknowledging Stephanie as she is a great server! We look forward to your return! My Wagyu beef entree had grit in the scallions. I chose not to mention it because of my sensitive dinner companion. Thank you for your review. I'm sorry about the scallions and will pass this on to the chef. We do appreciate your visit and hope to see you again soon. Thank you for the great review and acknowledging our great staff! Try the omakase next time for a full dining experience. We look forward to your next visit! The stir fried vegetables were correctly cooked and seasoned and made for lovely eating. Everything else, however, was not worth the visit, or the money. The crust on the chicken was not, the table agreed ,as good as that offered by fast food places and had nothing of what you expect of Japanese breading: lightness, crispiness (izanami's was a firm over-peppered and overcooked dough surrounding chicken that had been too long in the fryer). Ditto the crab, which was hard to find in the goo that filled its overcooked breading and was presented in unappetizing, unfortunate shapes. The tuna sashimi was so thinly sliced as to be limp and one of our party refused to eat it because it did not taste fresh. I think it was just the limpness and oil with which it was too heavily doused. And then we gave up. Ten Thousand Waves is wonderful, as it has always been. But not this addition. Toni, Thank you for your review and feedback. We're glad you enjoyed the vegetables and apologize if some of the items weren't cooked the way that you prefer. There are many wonderful things on the menu and we do hope you will visit again. Eating at Izanami is like having a treatment at Ten Thousand Waves. I felt the same relaxed, satisfied feeling after my recent meal at the restaurant. The service is impeccable, starting with the hosts at the front desk. Dishes are delivered and taken away in a timely manner and the waitress was attentive without being intrusive. Our table had an outstanding view of the mountains. And, the food matched the ambience. We had two orders of sashimi, which we devoured. It was fresh with a tasty dipping sauce. We also enjoyed the asparagus wrapped in serrano ham, the tori no karaage, and the shichimi fries plus the Chocolate Dome was an outstanding desert for only $10. I found the prices surprisingly good and our total dinner cost less than $90 for two. For a good value in a great setting, Izanami can't be beat. Peggy, Thank you for the great review! We're glad you had a similar excellent experience with our dining as you had at the spa. It sounds like you enjoyed all you ordered (the chocolate dome is one of my favorites). We hope you are able to visit us again soon! I ordered the rice trio appetizer and being Asian, one is a bit of a rice critic. I don't recall in past times that the rice balls being on the dry side, but they were definitely not where they should have been in flavor or texture. There was a lack of stickiness / glutinous texture to the rice triangles and there was not enough shiso in one and not enough kimchi in the other, to warrant those flavor descriptions. Their burger, which I asked to be cooked the way chef would prepare it -- medium rare, in fact came out well done. There was nothing pink nor rare to the meat. I did not complain, or send it back -- that is not my style. I just observed and still appreciated the delicious flavors from the burger. I would definitely order this again. The trio of sorbets were very good that evening -- kiwi, papaya and coconut chocolate. And the complimentary still or bubbly water was appreciated by all. Thank you for your reveiw. We will pass your comments to the chef and are glad you enjoyed the delivious flavors of the burger. We hope to see you again soon! 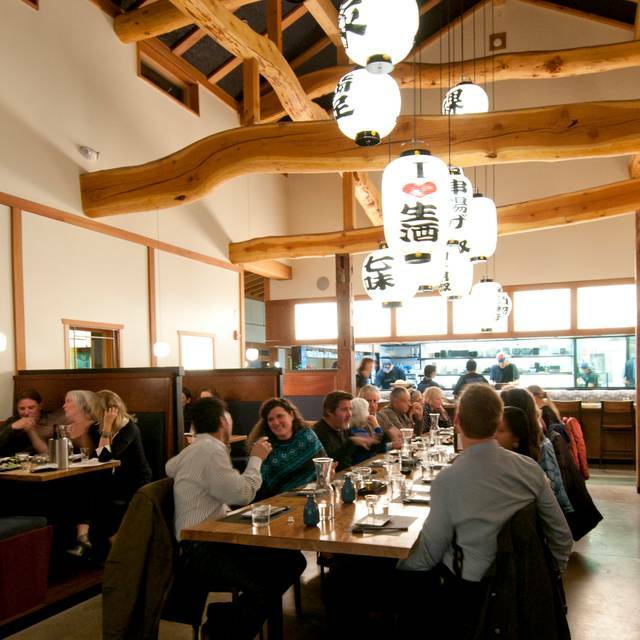 Yaz will great you and you will be treated to the best Sake in the US and a wonderful lunch or dinner. Mike, Thank you for the great review! We all hope to see you again soon! My family and I can always count on the quality menu, variety and tastiness of the excellent food. The service is always spot on! We love Izanami! Jill, Thank you for the great review! We feel we have the best restaurant staff in Santa Fe and appreciate the acknowledgment. We look forward to your next visit! We have been here for lunch before and it was fantastic. This time we went for dinner since we were in town for Spring Break. We had high expectations but were extremely disappointed. My husband and I ordered the omakase dinner, which has a higher pricetag than most items. The kids ordered their food separately. The first couple courses came out quickly and then everything stalled, for a very long time. Tables around us were getting their food. They did not order the omakase. After complaining, our food started coming out faster. My complaint is that if you are going to charge top dollar for a special meal, it should be a priority to get that meal in a timely manner. The courses were good, nothing crazy though. I was so frustrated by the time we got the fourth course that nothing tasted good. The kids went crazy for having to sit for so long. I think the restaurant is fine for lunch or fine for ordering off the rest of the menu, but when it comes to having something special....not worth it. The manager did take off a couple of items that the kids ordered. Still, we had ordered a nice bottle of sake too. Our bill without tip was over $200....and we left frustrated. Not good. Thank you for your review. We're glad you felt our lunch was fantastic. We will speak with our staff about communication and timing of our omakase, especially when not all of the guests have ordered the omakase. Our food was amazingand our server was fantastic. We had the chef's choice meal and loved it. Different than what we would have chosen but such a treat. Thank you for the great review and we're glad you chose something you may not have ordered when getting the omakase, and that you loved it! I felt taken care of by everyone I encountered at Izanami. I will definetly be back! Thank you Sarah - we look forward to your next visit! It was great! My only suggestion is to not keep coming to the tables asking to clear things. Pam, Thank you for the great review and your suggestion, which we will pass on to our front of the house staff. We hope to see you again soon! One of the best restaurants in northern NM. Amazing meal cooked to perfection with over the top service. Get the brussel sprouts! Penny, Thank you for the great review! We will pass on your comments and hope to see you again soon! Food was good but not as outstanding as week previous. Different line cook? Still delightful. We have been to Izanami many times & it never disappoints. We had friends visiting from Napa & they were very impressed with the food, service & the ambiance. Their daughter is vegan so the vegetable tapas were perfect for her. Our server was very attentive & friendly. Thank you for the great reveiw Kim! We're glad your friends Daughter was able to enjoy our Vegan offerings - We look forward to seeing you again soon! 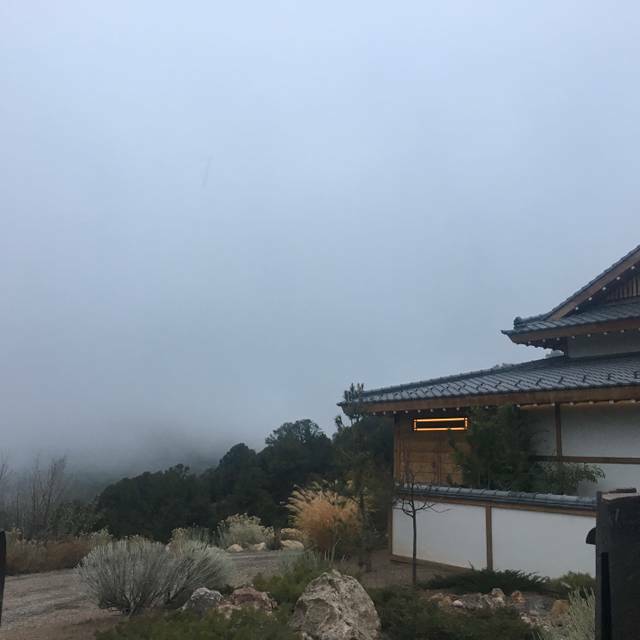 Our time at Izanami was a part of an overall spa/dining getaway in Santa Fe. 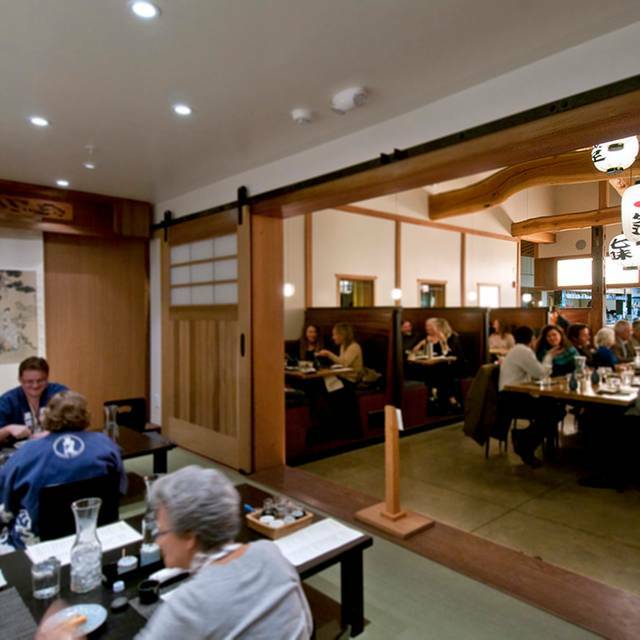 An outstanding menu and Sake list, Izanami is a “must experience” diner’s delight. We had one guest who chose the chef’s tasting, while the rest of the table pooled our ideas into a family style feast! Kudos for the octopus and for the mushrooms. The treats kept coming with the final top off being a wonderful mixture of sweats at the end of the meal. While this restaurant may not be convenient unless spending time at Ten Thousand Waves Spa, it is a perfect add-on to your experience. Thank you so much for the great review. 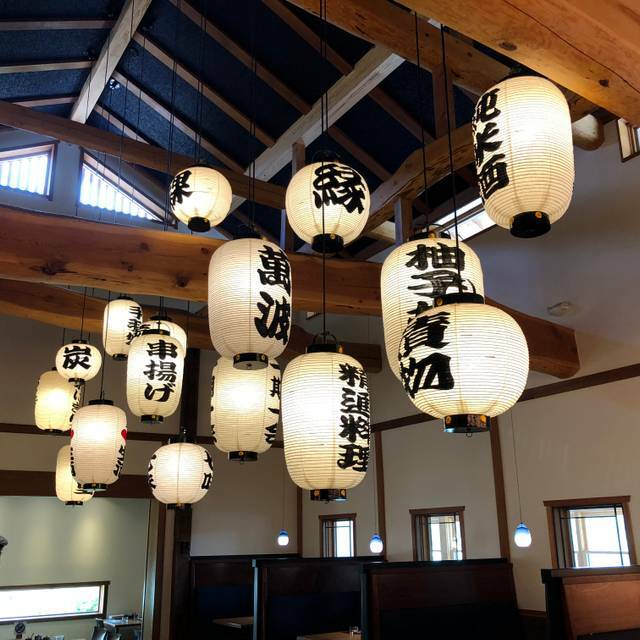 We're glad you enjoyed Izanami and were able to experience a variety of dishes! EXTRAORDINARY SERVICE FROM START TO FINISH AND THEN SOME!!!! Amazing food, service, and atmosphere. Izanami is a perfect place for a nice date or double date. 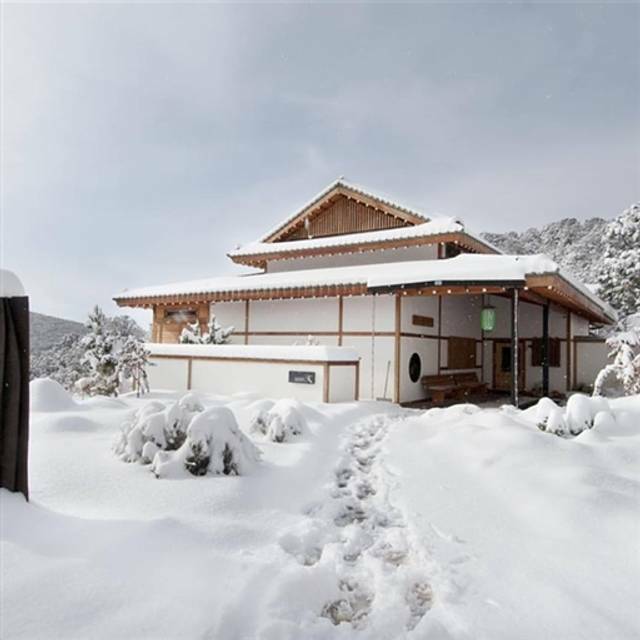 The location doubles as a spa, so the atmosphere is inherently quiet, but not too quiet. The waitstaff was very accommodating and clearly knew the menu well, and gave us suggestions on drinks. Food was absolutely delicious. Ryan, Thank you for the great review - We hope you are able to visit us again soon! Great place. 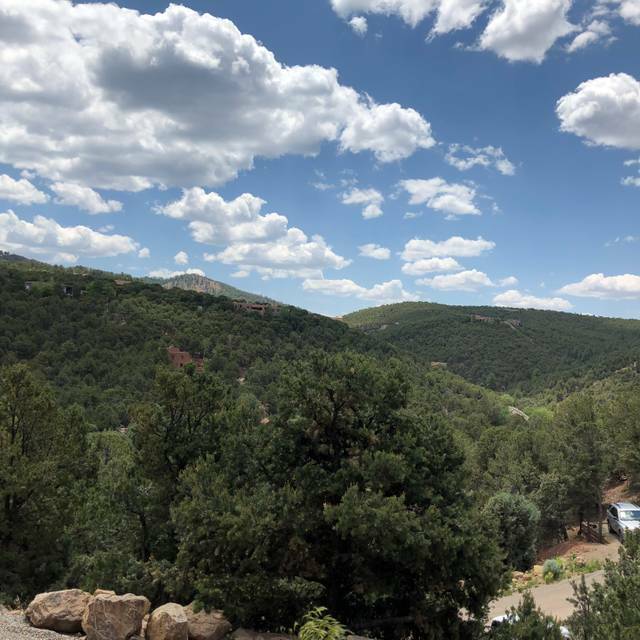 Sat in the rear dining room and the views were serene of the santa fe mountains. Averall great place. Thank you Brandon - if there is something we could have done to earn the fifth star, please let us know! We hope to see you again. Staff is a big family and you are part of their family at every visit. Kari, Thank you for the great review - We hope to see you again soon! Love this place! Service and food are outstanding! An interesting twist on Japanese food-interesting tapas. The oysters are unbelievable, tuna is yummy, and veggies innovative. Thank you for the great review! We agree with you on all counts and hope to see you again soon! Thank you David - we hope to see you again soon! Fabulous in every way. Delicious, beautiful, colorful, sensual. Wonderful service. the food and service was wonderful. However I have been here many times since it first opened and the portions are shrinking!!!! !We left hungry after sampling many if not up to 8 dishes between 4 diners. Increase the portions since it is pretty pricey!!!! !Love the space, the vibe, and the food. Just give us more!!!! Thanks you for the review Prudence. Depending on the two dishes, there are items that are more filling than others and we will always look to trying to provide more value without jeopardizing quality. We hope to see you again soon! Perfect, a fabulous culinary adventure, as always. 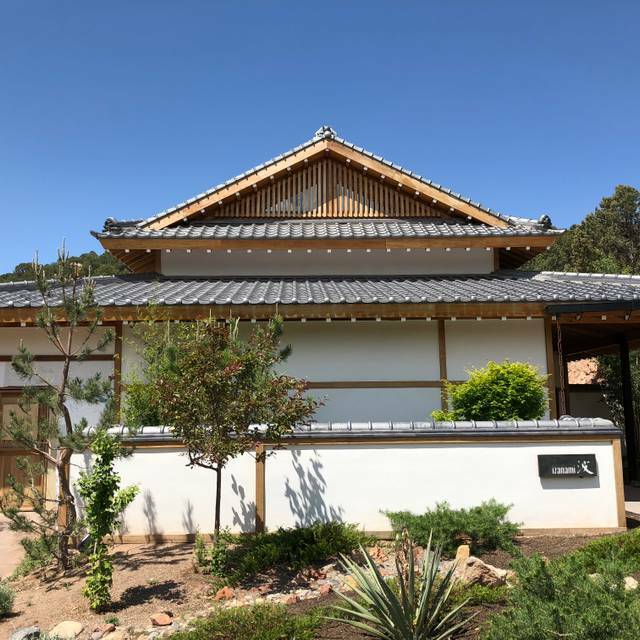 We’re local, we rate Izanami as #1 in Santa Fe. Seriously. We have lived here almost 30 years. This is, inarguably, the Best. Make sure you reserve a booth in the front room with high ceilings. The back room is not our favorite. Absolutely a must if you’re visiting and of course, add spa activities to your visit. We enjoyed the chefs tasting menu, “omakase” this was so creative and fresh. Thank you both so much for the great review and continued patronage. We look forward to seeing you again soon! We got the omakase menu and the dishes were hit and miss. I wished we went ala care instead. We've had omakase menus across Japan and while this place was beautiful, the food did not match up to what we were hoping for. Sahara, Thank you for your feedback. We are glad some of the dishes were to your liking and will give your feedback to our chef. We do hope you join us again for an ala carte experience. For a special birthday celebration we combined a spa day, massages, dinner at Izanami and an overnight in one of the guest rooms. It was all wonderful. Bill, Thank you for celebrating your birthday at Ten Thousand Waves! We are glad you had a wonderful time and hope to see you again soon! Excellent food and sake flight for Intl Women’s Day was wonderful. Mateo, the sommelier, was so passionate about the sakes he served us. It was so interesting to hear the stories and women behind them. Jackie, Thank you for the great feedback and we were glad you enjoyed Mateo sharing his wealth of knowledge of our sake, and in particular the female brewers we are featuring this week for Intl Women's Day! We hope to see you again soon!